Scientific Name(s): Quercus robur L.
Photographer(s) Appreciation: Thank you once again to Eike Jablonski of Luxembourg for sharing a photograph from his travels in Europe (and also for writing some of the entry!). Much appreciated! Yesterday, I had the pleasure of guest-instructing UBC’s Horticulture Training Program students on a winter twig identification walkabout. 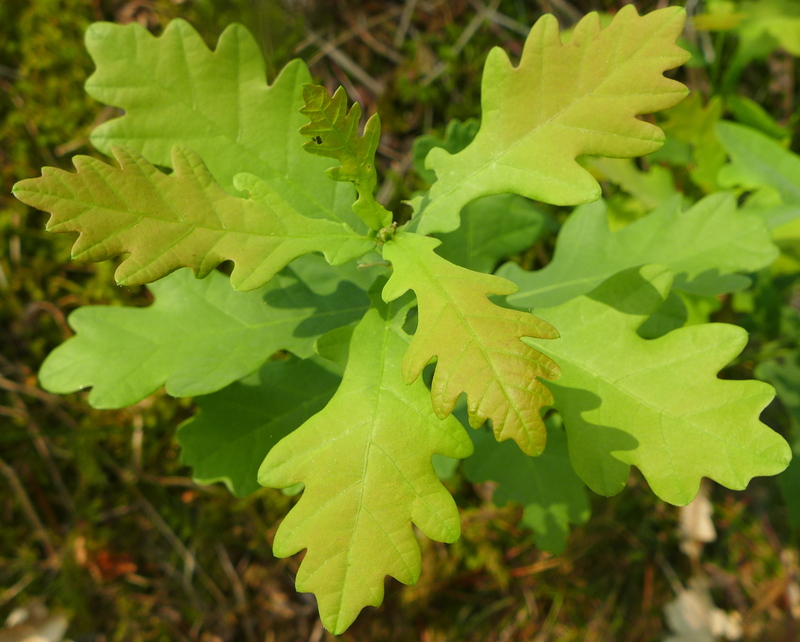 For our last species on the list, I couldn’t remember whether we were to look at Quercus robur (common oak or English oak) or Quercus rubra (red oak). We eventually sorted out my forgetfulness (it was the latter). Since I didn’t have a chance to visit UBC’s Quercus robur yesterday, I thought the species would be a good BPotD entry for today! 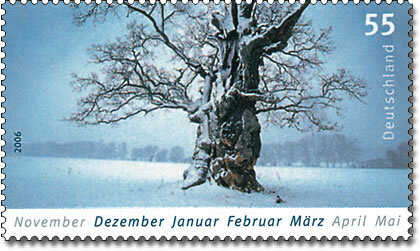 An old (about 600 years old) Quercus robur in the Sate Domain Beberbeck near Hofgeismar, Kassel; This beautiful domain is located in a part of the Reinhardt forest (Reinhardtswald), where the fairy tales of the Brothers Grimm, who lived nearby, are located. You have certainly seen the old oak trees in this area. The acorns of these oaks have been used for centuries as “pig’s food” and have been chopped from time to time. There are several hundred oak trees of this size in the area. The picture was taken 2 years ago in December, and coincidentally this oak was also used as a motive for a stamp I made almost from the same place without knowing this stamp at that time (I add it here for info). Wonderful photo and write-up, thank you! The Caspar David Friedrich painting, “Der einsame baum” immediately came to mind. I think it is an oak, perhaps Quercus Robur! Awesome photo and description. Where might one get one of the stamps? …. and Eike Jablonski’s beautiful photograph could itself be a painting! Here in Squamish there are many Quercus robur in the higher parts of the Estuary (eg. old raised dykes) and surroundings where bears also live. In the fall of 2016 the large Q. robur in Rose Park by the Blind Channel was laden with acorns and two bears were crossing the highway daily to eat them. The District responded by cordoning off a very large area to keep the people out (and safe), enabling the bears to feed in peace. Are the bears playing a key role here in helping to distribute the oak seeds? Such a beautiful, serene scene. Thank you for the entry information, Daniel. The last few years I’ve been finding young quercus seedlings hiding amongst the rhododendrons in my garden – & I don’t even have squirrels. Do I treat them like invasives or try & uproot them for planting elsewhere? What a beautiful old being! At home and rest in the Winter. Wow! Fabulous photo! Fabulous tree! How does the soil and climate affect the chararisticsof theokawhen used foraging wine. French oak, Hungarian oak, English oak are all quercus robur. Dear all, Thanks for your comments! I remember well how I strolled along this very remote forest a Sunday morning, after two days of botanical conferences at nearby Goettingen University. 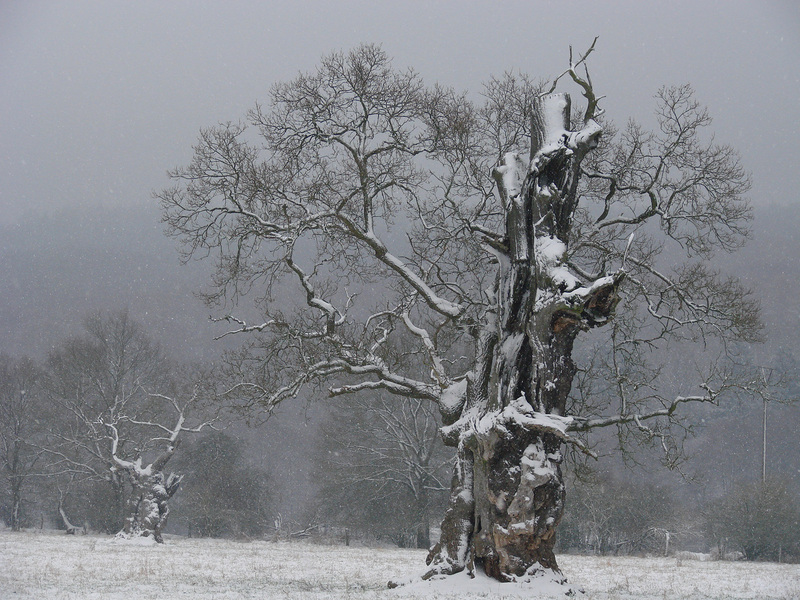 Old oaks and also Beeches, and it snowed quiete heavily. Close by this tree grows one of the eldest Wild Apple (Malus sylvestris) known in Germany, and weird Hornbeams from forgotten times. A magical place indeed. Kitty – if you like I can look up for these stamps. Bill – here, we call Quercus petraea “French Oak”, Q. frainetto is “Hungarian Oak” and Q. robur is “English Oak”. I think that Hungarian oak is Quercus frainetto and does not grow in the territory of presentday Hungary. I actually gasped when I opened this post and saw this oak. My goodness, it is magnificent!!! “Oak: the frame of civilization “ by William Bryant Logan, a great read for oak appreciators ! Thank you for this entry, Daniel and Eike. The tree oozes nobility. I would love to see the Reinhardt Forest – several hundred this old, that would be a treat. Beautifully photographed.